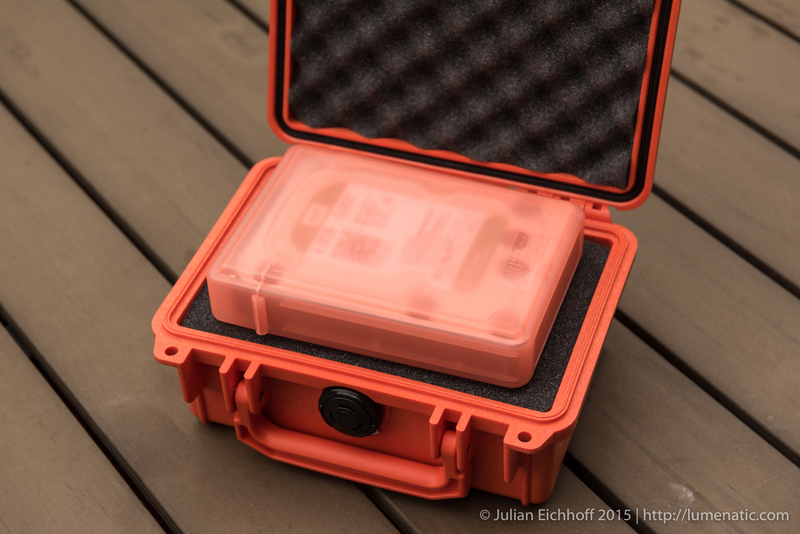 I have written a more than healthy amount of posts about backups, archiving and data storage. 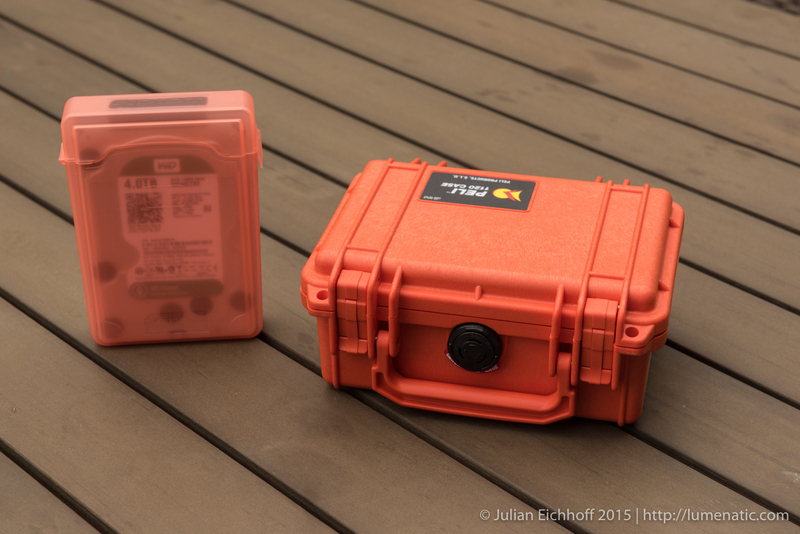 If you have followed my blog you already learned about my backup strategy (Link 1, Link 2). There are three copies of my archive: On my NAS and a carbon copy on two separate 4 TB drives. One of those two drives is not deposited in our house. This “external” drive is sheltered in a plastic case, which I put into a cardboard box with some bubble wrap. 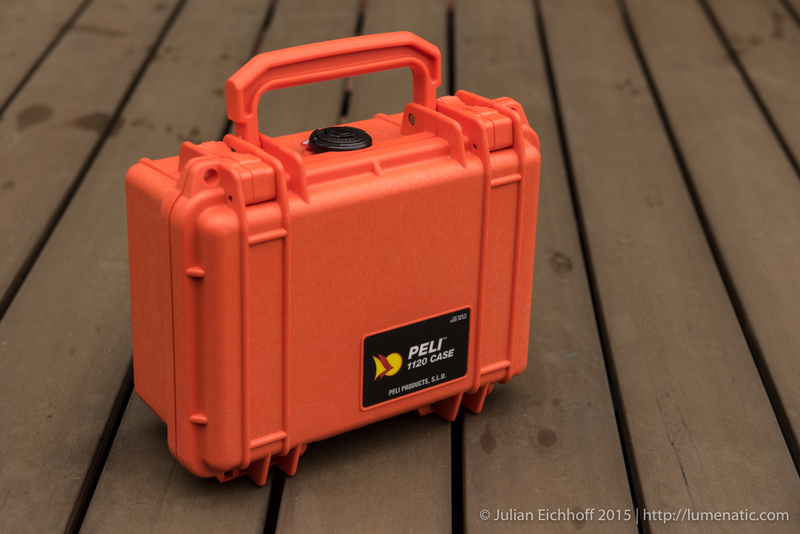 The cardboard solution was bothering me for quite a while and I decided to get the best protection I can think of – a Peli case. 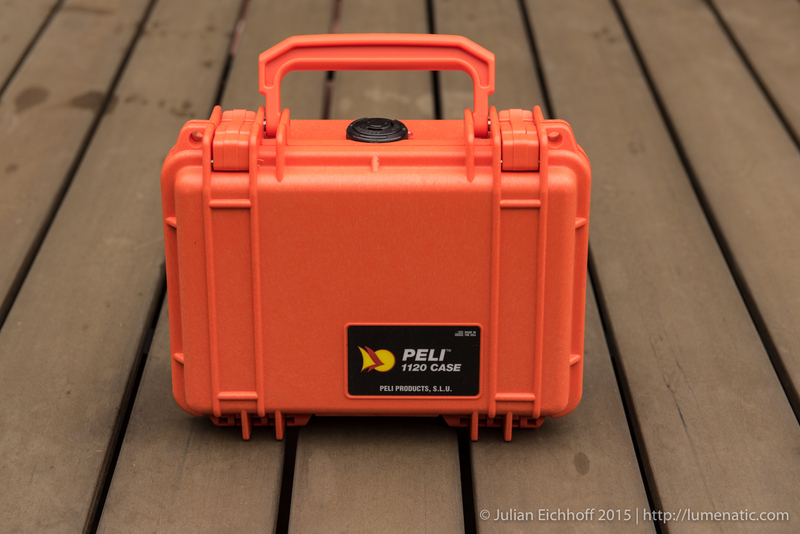 Peli cases are rugged, watertight boxes which come in all sizes. The smallest one is big enough for a harddrive, the biggest one can hold military equipment like shoulder-mounted rocket launchers or rifles. 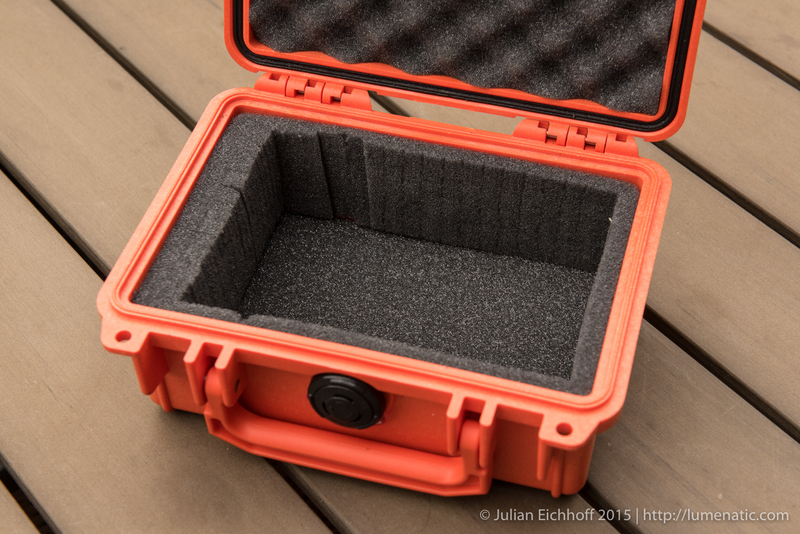 I decided to go for a Peli Protector 1120 case with pre-cut foam. 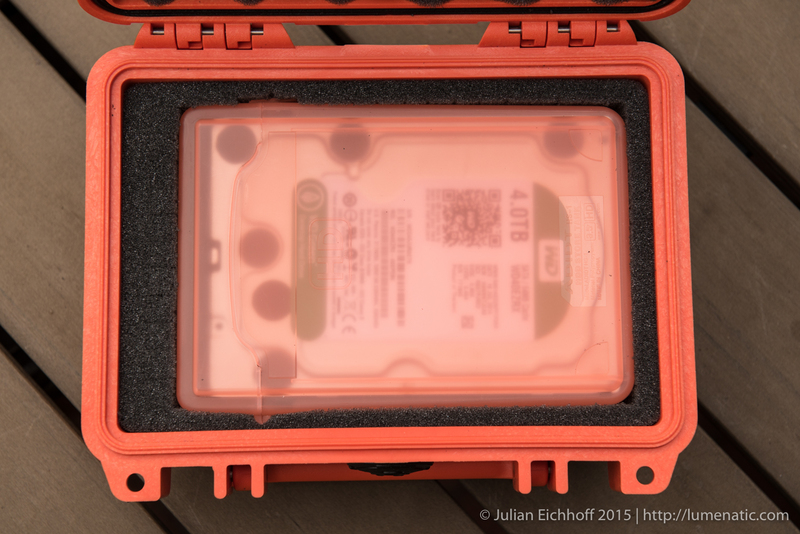 It came at a price of 40 € – not cheap for storing your HDD but I wanted one of those indestructible, stylish cases very badly. As you can see the box is completely filled with foam. At first I placed the encased HDD on the box to see where foam had to be removed. You can mark the corners with toothpicks if you like, but in my case most of the foam had to be taken out, so there was no need for special marking. The foam is pre-cut and can be ripped apart easily. The foam is not cut into cubes as I thought, but into long stripes. The border of the foam is not pre-cut. Since the hinges of the plastic box are larger than the cutout, I had to carefully saw away some material with a sharp kitchen knife. Cutting the foam can be made with high precision, I was surprised as I though it would be more complicated. Since the cut-out was too deep for the HDD I took some of the foam which I removed in step one and placed two layers on the floor of the box. The encased HDD fits snugly into the foam. Once the lid is closed the drive is protected against moisture, water and physical impact. Bottom Line. 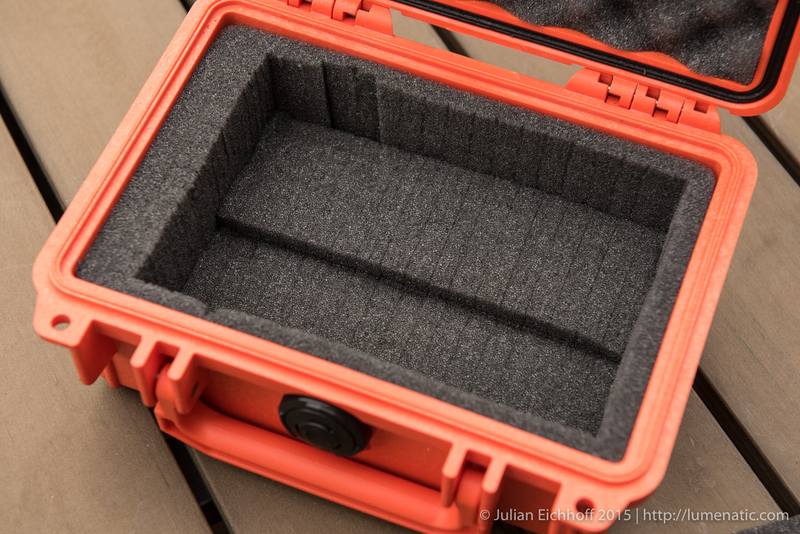 A Peli case is not the cheapest, but one of the best ways to protect your gear. 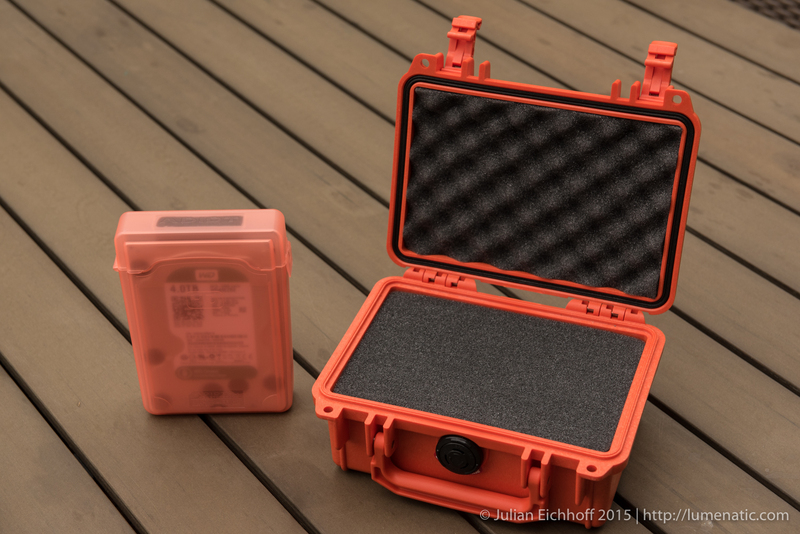 The cases are virtually indesctructible and can endure a lot of abuse while the content is still safe and unharmed.